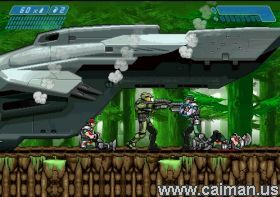 Caiman free games: Halo Zero by Dobermann. 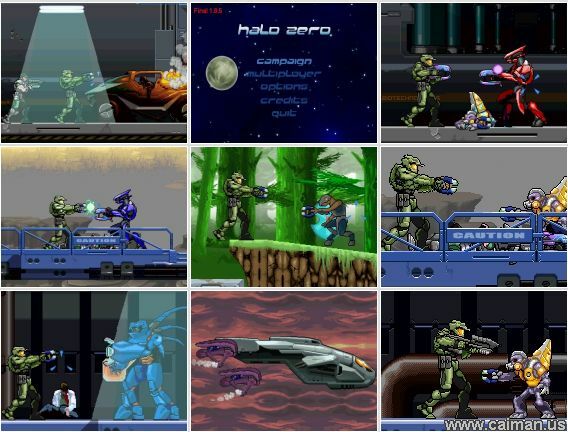 Halo Zero is a 2D fan game, based on a story before Halo 1, with the Reach battle. The main object in single player mode is to shoot, shoot and get to the end of the level. But, the later of the 10 levels are a bit more complex than this. The game can also be played in multiplayer mode where you can host or join a game. Before you even start the game you can choose the english or french language, redefine your controls or even set your level of dificulty. At the beginning of each level you have a helper, a marine who is ready to help fight off the enemies. In between levels there are interesting animated cut scenes that follow the story. 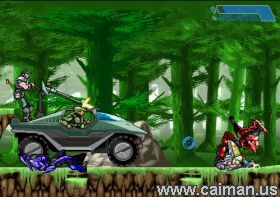 During game play, you will findup to nine different weapons, including a sniper rifle, rocket launcher, plasma gun and grenade. Halo Zero has great sound and graphics, even down to the lense flare and glare caused by looking towards the sun. If you`re a Halo fan, this is a must have. If not, then download it anyway because it is a fun shooter.